We have longed for flight since the beginning of time, but what awaits us in the vast expanse of the beyond? Theatre Yes is taking flight into the great unknown of the Citadel Theatre with their latest production, Slight of Mind. 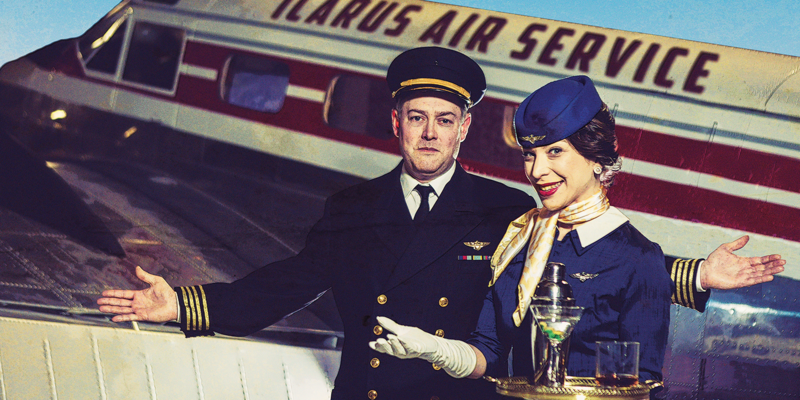 Climb aboard Icarus Air as Slight of Mind sends you to places you can only imagine. From sky to sea, from opulent lobbies to hidden caverns, this roving production promises to take its audience on an intimate and unparalleled journey to the truth at the core of every myth. Theatre Yes, in collaboration with the Citadel Theatre, presents an adventure that defies space and time with its newest work, intertwining three stories of human flight into one incredible production by local playwright Beth Graham. Slight of Mind re-tells the tales of three legendary figures whose feats made them mythic: Amelia Earhart, the fearless pilot whose disappearance during her attempt to circumnavigate the globe is one of the most enduring mysteries in aviation history; Valentina Tereshkova, the Russian cosmonaut who became the first woman in space; and Icarus, the boy from ancient Greek lore who famously flew too close to the sun. Slight of Mind runs March 29 to April 7, 2019, at the Citadel Theatre in every space but the theatres. Guests will check in at Box Office and be directed to the secret starting point of the production. Tickets are available at www.citadeltheatre.com and 780.425.1820. Tickets start at just $30 plus fees and GST. Theatre Yes is delighted to be collaborating with the Serving Communities Internship Program (SCiP), a Volunteer Alberta initiative, which has allowed us to offer internships to eight post-secondary students who join the Icarus Air family as Production Assistants on Slight of Mind . Our SCiP participants are: Sherry Alvaro, Amber Beddoes, Frances Bundy, Tyson Goudreau, Andrea Murphy, Tara Nickelychuk, Anika Plitt, Abigail Troppmann. Learn more about the Cast and Creative Team. Theatre Yes would like to acknowledge the generous support of our opening night sponsors, Penny Ritco and Brian Dooley. We also extend our boundless gratitude and thanks to the following individuals and organizations, whose assistance helped make this show possible: Stephen Williams, Murray Farnell, Brooke Leifso, Talua Manning, Jason Chinn, Nicole Moeller, Derrique and Dave Degagné, Émanuel Dubbeldam, Murray Cullen, Victoria School for the Arts, L’Unithéâtre, Volunteer Alberta, Adam Tsuyoshi Turnbull, Stephen Humphrey, Hugh Neilson, db Photographics, Epic Photography, Nico van der Kley, Jane Klein, the University of Alberta Props Department, Fringe Theatre Adventures, St Albert Children’s Theatre, Edmonton Arts Council, the City of Edmonton, Alberta Foundation for the Arts, and Canada Council for the Arts.